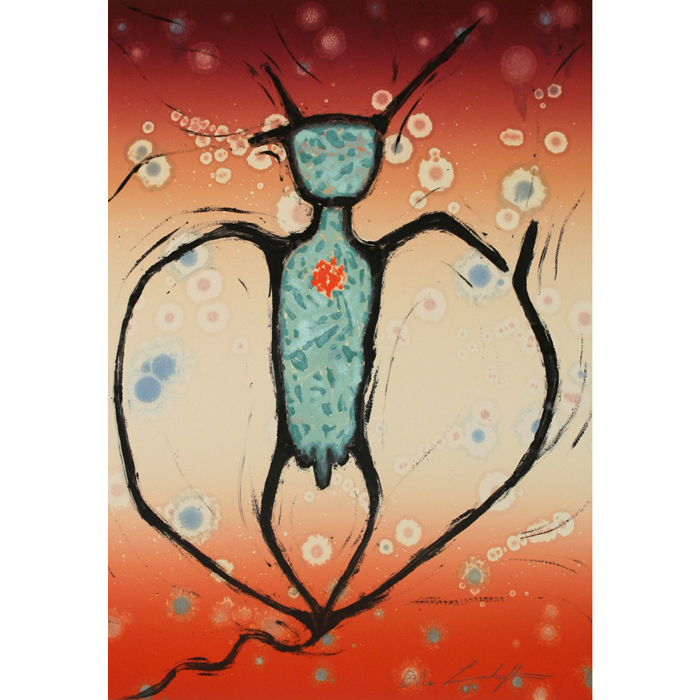 As Rainmaker Gallery celebrates 25 years of exhibiting Native American art in England, we look back to the work of our very first visiting artist, the late Dan Viets Lomahaftewa (1951-2005). Dan Lomahaftewa created distinctly spiritual works of art that resonate vividly across deep time. He sought to communicate the strong continuum that connects ancient ancestors to the peoples of today, to future generations and beyond. In his extensive research of petroglyphs and pictographs Dan Lomahaftewa visited many sites of ancient rock art created by indigenous ancestors. These timeless forms, infused with the intense colours of the Arizona desert and southwestern skies, often appear as subjects of his paintings and prints. Another subject matter of particular fascination to the artist were the many Hopi dieties known as Kachinas or Katsinas. Hopi symbols such as spirals, clouds, stars and dragonflies also frequently appear in his work. “Much of the design elements used in my work metaphorically symbolize my personal interpretation of the philosophy, lifeway, story, and history of earth rhythmed people with an emphasis on Hopi. Their meanings should be perceived with knowledge of the basic tenets of striving for harmony, balance, good health, prosperity and happiness in our lives through acknowledgment, giving thanks and respect for and to all things in creation.” Dan Viets Lomahaftewa, 2005. The title of this exhibition, Looking for Beauty in the Future, is a translation of Lomahaftewa, the artist’s Hopi family name. Dan Lomahaftewa’s generosity of spirit and desire to share and embrace the world around him led him far beyond his ancestral homeland. His magical paintings and passion for cultural exchange earned him awards, grants and fellowships to exhibit and travel extensively in Asia, Europe and the Americas throughout his career as an artist. Artwork in this exhibition includes paintings, monotypes, etchings and collographs, and is the last remaining inventory offered for sale by the artist’s family.